Melioidosis. Multiple abscesses in the spleen of a pig. Melioidosis is an infectious disease of pigs, goats and occasionally of other animals caused by Pseudomonas pseudomallei, present in several tropical and subtropical countries in the Asia-Pacific, Middle East and Caribbean regions. It causes fatal infections in a significant proportion of infected humans, especially those who are immuno-compromised or have intercurrent disease. Transmission : Infection occurs by ingestion of the infective material containing Pseudomonas pseudomallei, contamination of wounds or abrasions of the skin or perhaps bites of insects. Important sources of infection are rodents, contaminated swamps or muddy water. The organism can live up to three months in shaded soil. Incubation period is variable, longer in pigs than in other animals. Enlarged lymph nodes, particularly the sub-mandibular nodes in pigs. Most cases in pigs are chronic and these may not show clinical signs. In sheep the clinical signs include high fever (41°C), nasal and ocular discharge and gradual emaciation. 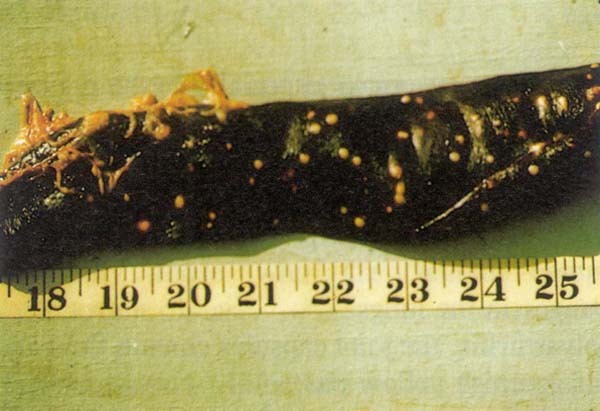 The abscesses contain a thick, caseous greenish yellow or off white turgid pus. There is usually no calcification. Suppurative polyarthritis, the joint capsules contain fluid and large masses of greenish yellow pus. In sheep the gross finding includes abscesses and suppuration in the nasal mucosae. Judgement : Carcasses suspected to be infected with melioidosis should be isolated and retained, and the affected tissues, preferably an excised unopened lymph node and the spleen with abscesses should be sent to the appropriate laboratory for examination. Diagnosis is made on the basis of isolation, cultural examination and pathogenicity test. If there are no facilities for retention in isolation, the carcass suspected or tentatively diagnosed to have melioidosis should be condemned and properly disposed of. Persons handling the suspect carcass or material should disinfect their hands, forearms, knives and other contaminated equipment. If the laboratory report is negative the carcass has to be treated on the basis of the lesions present and the subsequent diagnosis. Differential diagnosis : Tuberculosis, non-specific purulent conditions. Caseous lymphadenitis in sheep and goats and actinobacillosis in sheep.